A car dealer who swindled customers out of thousands of pounds has been jailed for seven years. Gwyn Roberts collected deposits for new vehicles but then did not hand the cars over to the buyers. Roberts, 50, from Llandudno Junction, defrauded customers to "prop up his failing business", a court heard. He was convicted of 22 counts of fraud, worth a combined £722,000, and one count of fraudulent dealing at Caernarfon Crown Court. Judge Huw Rees said the car dealer had dealt with people in "an underhand way". Roberts' company, Menai Vehicle Solutions, went into liquidation in 2015 with debts of more than £1.2m. He had been a well-regarded car dealer, but defrauded people who had been loyal customers for many years, according to Judge Rees . The judge said: "You dealt with them in a shockingly dishonest and underhand way." 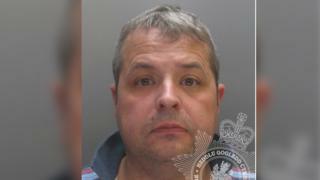 Det Sgt Christopher Hargrave of North Wales Police said: "Over 50 members of the public lost large amounts of money when they placed their trust in Gwyn Roberts to deliver the deals he promised them. "He knew at the time of making those promises that there was a significant risk to the victims' money. "His continued trading, even though the business had failed, was only an attempt to maintain his pride and his lifestyle."